UM-Flint seniors prepare to participate in a "Privilege Walk" professional development activity. 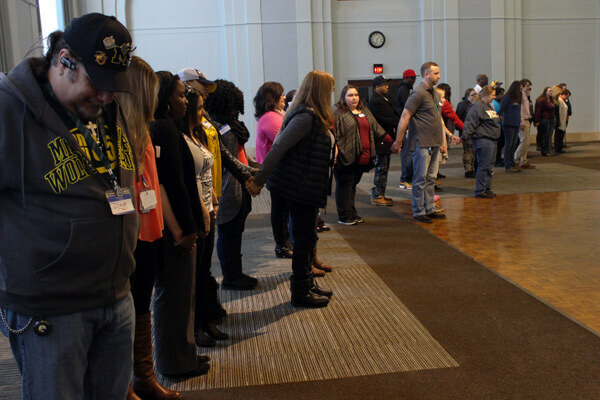 Standing together in a line and holding hands, the seniors of this year’s University of Michigan-Flint social work class closed their eyes and listened as their professors posed questions that prompted them to deeply reflect on their life experiences. They waited silently for each question before taking a step forward or back depending on whether their responses affirmed a memory or life experience. Questions ranged from their influences during childhood, the kinds of neighborhoods they lived in and schools they attended, their relationships with friends and family members, family values, and experiences with poverty, discrimination, and substance abuse. As they stepped apart from one another in response to each question, and let go of the hand of the person next to them, their straight line broke apart—symbolizing their differences and commonalities. 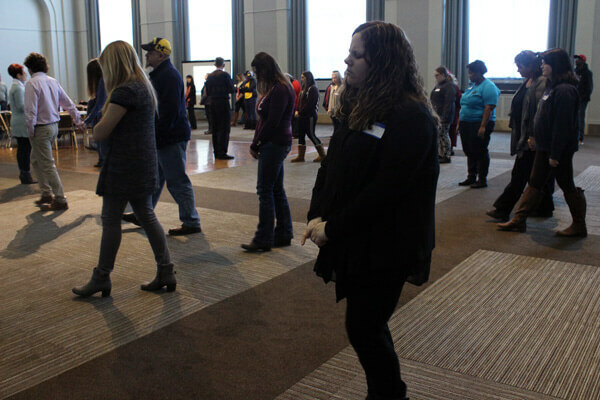 By the end of the “privilege walk” activity, students and faculty were standing in scattered areas of the room and taking a moment to reflect on all of those familiar areas of their lives that overlap race, class, social status, and other perceived social boundaries. Social work students and staff begin to step apart in response to faculty-led questions. 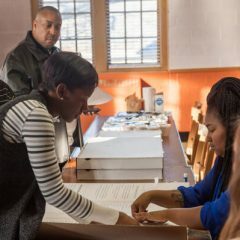 The Social Work Department’s “privilege walk” was more than an exercise of self-discovery followed by roundtable discussions about ethics, substance use, race, social justice, discrimination, and personal strengths. It was the last of three experiential program requirements that encourage seniors to reflect on their professional growth, to consider certain types of privilege, and to learn how their actions and beliefs can potentially impact their future client relationships. These seniors have started working on their own critical reflection papers following this experience. The “privilege walk” helped students to see how their unique life experiences have shaped them over time and to understand how self-reflection can be a useful tool to illuminate barriers and ultimately improve relationships on both personal and professional levels. 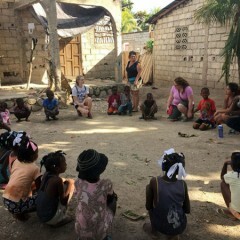 Students listen, reflect, and respond to questions about their life experiences. 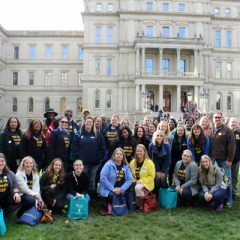 UM-Flint’s Bachelor of Social Work (BSW) degree prepares students to enter a challenging profession and learn to address the needs of a diverse client population in ways that are not limited to case management.